Ofsted’s ratings of each state school as ‘Outstanding’, ‘Good’, ‘Requires Improvement’ or ‘Inadequate’ are frequently used by parents. The giant PVC banners that adorn many school gates are testament to how much weight is placed on the judgements made by inspectors. Ofsted’s own research has shown that their ratings are the second most important factor for parents when choosing a school (behind ‘proximity’) and two-thirds of parents believe that Ofsted is a valuable source of information about education in their local area. Ofsted occupies an important position in our education landscape and the process of inspecting schools can, if done in an appropriate and proportionate way, have a positive effect on the quality of education being delivered. Even so, inspecting over 20,000 state schools is a considerable undertaking and our school system has also changed dramatically over the past quarter of a century. Consequently, this report seeks to answer four questions: first, can parents trust the grades given to schools by Ofsted; second, is Ofsted measuring the right things; third, what impact does Ofsted have on teachers and school leaders; and fourth, do Ofsted inspections lead to better schools? Since it was created over 25 years ago, Ofsted has not published any research to support the notion that their judgements on schools accurately reflect the quality of education that a school provides. As far back as 1996, Ofsted’s research had shown that pairs of inspectors awarded different grades after observing the same lesson in 33% of cases. A parliamentary committee in 1999 heard evidence from academics who declared that the consistency in inspectors’ judgements was simply “not there” and that the judgements were “not very reliable”. It was almost two decades before Ofsted revisited the issue of reliability in a 2017 study that showed inspectors largely agreeing on simple binary judgements about each school, but the findings were criticised in terms of the design of the study and the failure to secure greater agreement between even the most experienced inspectors. Independent research on the ability of observers, including highly-experienced school leaders, to accurately judge what is happening in a classroom is equally concerning. Numerous studies have shown that you need multiple observers watching the same teacher on multiple occasions before their opinions start to converge (even then, observers tend to disagree about 20-30% of the time). This compares to Ofsted’s stated approach of an inspector “spending a few minutes in each [lesson]”. Research has also found that overall judgements on schools made by Ofsted inspectors were no better at predicting a secondary school’s future performance than just looking at the past two years of GCSE results. In addition, of those primary schools performing below the government’s minimum ‘floor standard’, 69% were rated ‘Good’ or ‘Outstanding’ by Ofsted. For secondary schools below the ‘floor standard’, 35% were rated ‘Good’ or ‘Outstanding’. Other research has shown that of those schools that had received ‘Outstanding’, ‘Good’ or ‘Requires Improvement’ grades at their previous inspection but whose performance had since deteriorated substantially, 47% of primaries and 33% of secondaries actually saw their Ofsted grade improve at their next inspection. This shows that many schools performing very poorly in national assessments are still being awarded high ratings by Ofsted. The new ‘inspection framework’ released for consultation by Ofsted in January 2019 contains some positive developments such as paying more attention to how a school designs and implements its curriculum. However, Ofsted has not published any studies showing that inspectors will be able to make consistent judgements in these areas across thousands of schools, even though the new framework begins operation in September this year. Ofsted has also stated that lesson observations will still carry considerable importance in future inspections, despite the wealth of evidence suggesting that they are not valid and reliable tools. What’s more, Ofsted has signalled that ‘book scrutiny’ will play a much greater role in inspections under the new framework. Inspectors will spend more time comparing samples of books to “evaluate pupils’ progression through the curriculum”. The prospect of exercise books being scrutinised in this way raises crucial questions about reliability and validity yet again. Ofsted has not published any research to demonstrate that inspectors can make accurate and consistent judgements on pupils’ work across the full range of National Curriculum subjects, GCSEs and A-levels, which is compounded by the fact that inspectors may not even be experts in the subjects or year groups that they are inspecting. Vague terminology from Ofsted is a cause of considerable frustration for teachers and school leaders. For a school to be judged ‘Outstanding’ for teaching, learning and assessment under the current inspection regime, teachers must “provide pupils with incisive feedback”. At no point in the school inspection handbook does Ofsted explain what ‘incisive feedback’ means in practice. The new inspection handbook for September 2019 seems to fare little better. For example, when judging the ‘Quality of education’, teachers will now have to “provide clear, direct feedback” without any explanation of what will be considered unclear or indirect feedback. To be judged ‘Good’ or ‘Outstanding’ for the ‘Quality of education’, school leaders must not use pupil assessments “in a way that creates unnecessary burdens on staff or pupils”, yet there is no clarity on how the ‘necessity’ of these burdens will be assessed. When judging the ‘Personal development’ of pupils in future, a school can only be rated ‘Outstanding’ if it “consistently goes ‘the extra mile’ to promote the personal development of pupils, so that they have access to a rich set of experiences”. Definitions of ‘going the extra mile’ and ‘rich experiences’ were notable by their absence. The fact that different Ofsted judgements appear to overlap significantly with each other also raises questions about their value to parents and other stakeholders. The overall grade awarded to a school is the same as the subgrade for ‘Outcomes for children and learners’ in 97% of cases as well as the subgrade for ‘Quality of teaching, learning and assessment’ in 96% of cases. This suggests that process-based judgements made by inspectors, and all the associated subjectivity and confusion, may be largely redundant if the data on outcomes can capture the effectiveness of a school and communicate this to stakeholders. There are also many aspects of school life that have previously not received much attention from Ofsted. As mentioned above, the increased emphasis on a school’s curriculum in the new inspection framework is a welcome development in principle. Moreover, extracurricular activities and careers advice are barely mentioned in the current inspection handbook so it is encouraging to see the new handbook go some way to addressing these historical omissions. For several years, Ofsted has published what they call ‘myth busters’ that seek to highlight specific practices that are not required by Ofsted but are still found in some schools. For example, one myth buster states that “Ofsted does not expect to see any specific frequency, type or volume of marking and feedback”. Nevertheless, inspectors continue to make comments about precisely these areas, as demonstrated by recently published Ofsted reports. A survey by the Association of School and College Leaders showed that schools are still being asked for evidence by inspectors that Ofsted says they do not have to provide. Inevitably, the influence of Ofsted can affect staff workload. Ofsted’s own surveys of teachers have shown that 76% thought school inspections would be “highly stressful for everyone” and over half of teachers felt that an inspection would “mean a huge amount of unnecessary extra work”. Most concerningly, 83% of teachers agreed that “Ofsted inspections introduce unacceptable levels of burden into the system”. An academic study in 2017 showed that “policy decisions [in schools] were often being made to conform to Ofsted’s expectations” and that “schools to some extent performed ‘the good school’ for inspections”. A survey of school leaders found that they “regularly felt incentivised to prioritise the interests of the school over the interests of particular groups of, usually more vulnerable, children.” The quality of education available at any given school could easily be diminished if teachers and leaders are more worried about what is best for Ofsted than what is best for their pupils. This has become even more pertinent in the context of on-going issues with teacher recruitment and retention. Ofsted is keen to emphasise its commitment to reducing workload. For instance, under the new inspection framework inspectors will no longer look at internal progress and attainment data of current pupils or students in the hope that staff will spend less time on data collection and analysis. That said, even if Ofsted no longer pays attention to internal performance data, the emphasis on book scrutiny in the new inspection handbook could easily replace one significant source of workload with another equally absorbing and burdensome set of tasks. Surprisingly, Ofsted has also decided that inspectors will now formally judge the workload faced by teachers and potentially mark a school down if staff workload is deemed too high. For an inspectorate that is widely recognised as being one of the root causes of many workload pressures to be judging school leaders on the workload they generate for their staff is counterintuitive, to say the least. Although many schools improve each year, recent data from Ofsted showed that 33% of primary schools and 58% of secondary schools rated as ‘Requires Improvement’ did not subsequently improve and a higher proportion of schools rated ‘Requires Improvement’ (11%) declined to ‘Inadequate’ compared to previous years. 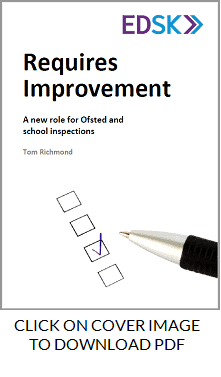 The NAO found that “Ofsted does not know whether its school inspections …raise the standards of education and improve the quality of children’s and young people’s lives”, although Ofsted’s new 2017-2022 strategy has attempted to address this by establishing several key performance indicators and targets. The views of headteachers and teachers on the impact of Ofsted inspections on school performance are decidedly mixed. In the NAO survey, only 44% of headteachers said that inspections had led to improvements in the school and Ofsted’s survey of teachers in 2018 found that just 31% shared this opinion. Academic research has concluded that a causal link between inspections and school improvement “cannot be clearly supported from the literature.” Looking across the full range of evidence, there does not appear to be a compelling case for concluding that Ofsted inspections necessarily lead to better schools. Despite their desire to be seen as a ‘force for improvement’, Ofsted’s own survey showed that just 24% of teachers agree that they perform this function. This report describes how Ofsted’s approach to judging teachers and schools is not based on research evidence from this country or abroad, nor have the reliability and validity of their judgements ever been satisfactorily tested and assured. While these issues could be tackled in isolation, the widespread effects of Ofsted’s approach to inspecting schools show that merely modifying existing processes and procedures will not be sufficient to bring about the changes that are now required. There is still a crucial place in our education system for an independent inspectorate that visits schools to provide parents of current and future pupils with valuable insights. On that basis, this report seeks to craft a new, more constructive role for Ofsted in which their goal is to help parents make more informed choices instead of trying to come up with all the answers themselves. By moving away from the notion of ‘grading’ schools and towards empowering parents with better information, the education community as a whole will reap the benefits of having a self-improving school system that includes Ofsted, but without teachers and leaders having to experience the burdens that inspections generate at present. If this can be delivered, our education system will be a much better, happier and healthier place.